Louisiana Advertising Flags, AKA Flag Banners, Custom Flags, or Business Flags, come in a wide variety of shapes and sizes. 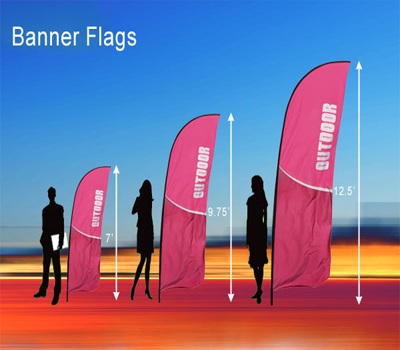 Most all advertising flags are custom printed with graphics to help promote or brand a business. They are typically for indoor or outdoor use and available with single or double sided print. 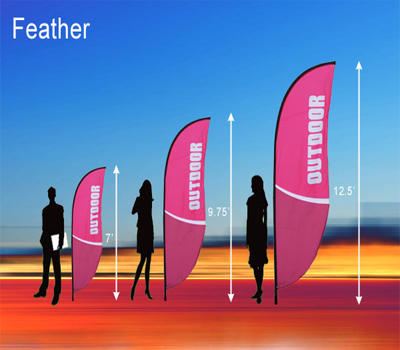 Feather banner is available as 3 sizes, comes with a complete hardware set for hard and soft ground with carrying bag. 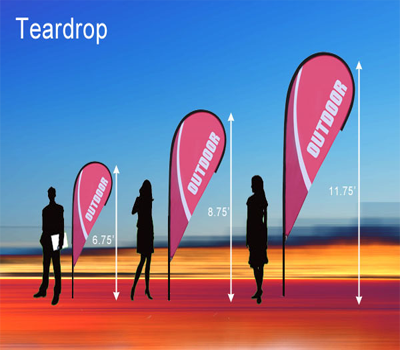 Its unique wind resistant design allows the graphic to rotate in the wind. Graphic stands 10′ tall when used with ground stake and 8′ tall when used with the floor base. 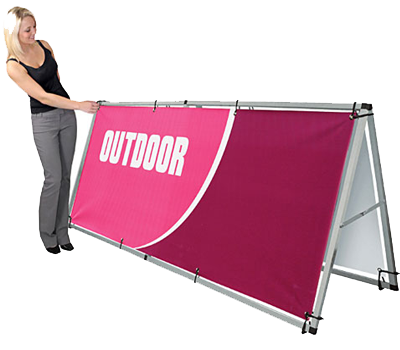 Straight banner is available as 3 sizes, comes with a complete hardware set for hard and soft ground with carrying bag. Its unique wind resistant design allows the graphic to rotate in the wind. Graphic stands ‘ tall when used with ground stake and ‘ tall when used with the floor base. The Blast Multi-Flag Outdoor Flag Stand can offer up to 5 Flag graphics to create excitement and get your message noticed! Perfect Advertising flag. Extending up to a full 19′-8″ high, the blast allows you to use 1-5 graphics as you require. Graphics printed on high quality outdoor flag substrate and resist weather and fading. This stand includes bungee corded aluminjum and steel poles, and a powder coated steel base. Comes with 4 ground spikes, and a rubber mallet. Blast is an eco-friendly choice! Never be missed at Expo or tradeshows. 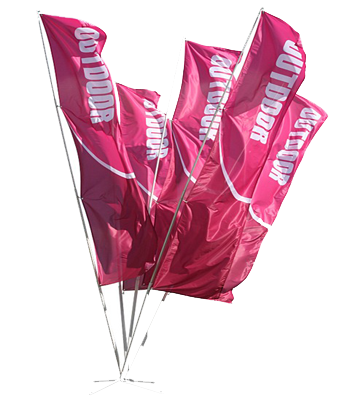 Our Wind Dancer flag poles include a hollow base to fill with water or sand for outdoor use. 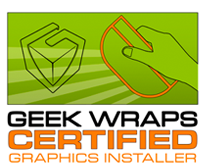 Graphics are printed on scrim reinforced vinyl with water proof ink. The Wind Dancer Light (A) features a fixed banner width of 31.5″ and height adjustment up to 13′ 6″. Its smaller size is easier to handle and position. 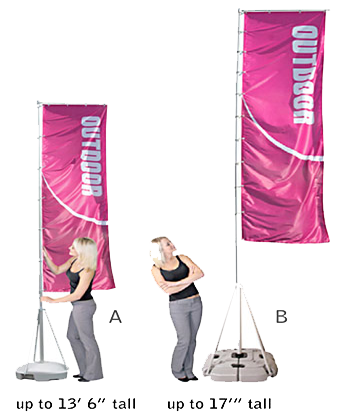 Our Wind Dancer Max (B) has a fixed banner width of 43″ and can be raised up to 17′. The base ships in four sections that you assemble prior to use. For Indoor or outdoor use. Graphic Type: Flexible Flag Material (Similar to Dye Sub) (Allow 1.5″ extra at top and left for fitting grommets). The new attractive Monsoon outdoor sign is a semi-portable single or double sided billboard. This strong frame billboard can withstand the outdoor elements. Easy to assemble and includes ground stakes & bungee rope.